Since ancient times music and singing played a role in religious ceremonies. This explains why many churches were provided with balconies for the choirs (cantoria after canto singing) and the organs. The raised positioning of both improved their acoustical impact and gave them a celestial effect. Since the XIIIth century architects and sculptors were asked to design and embellish these balconies. Donatello's cantoria in the Cathedral of Florence (now in Museo dell'Opera del Duomo), as many other aspects of the cathedral, had a great impact on popes Eugenius IV and Nicholas V and their successors. 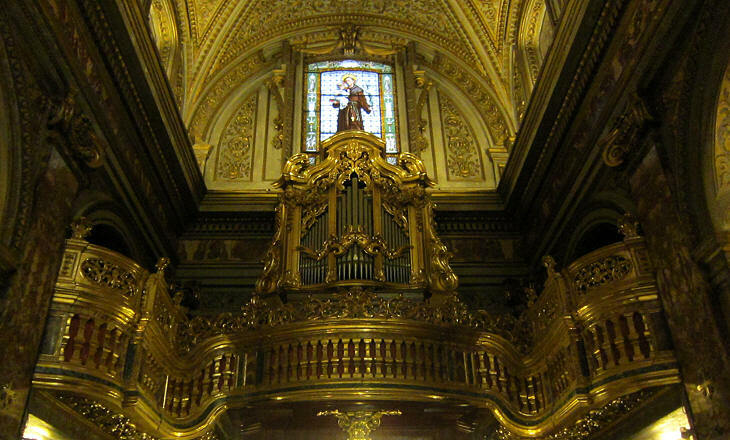 Nicholas V relied on a German organ maker to provide St. Peter's with an organ for the Holy Year 1450. For the Holy Year 1500 Pope Alexander VI erected a large cantoria in St. Peter's supported by six columns, but it was lost when new S. Pietro replaced the old basilica. 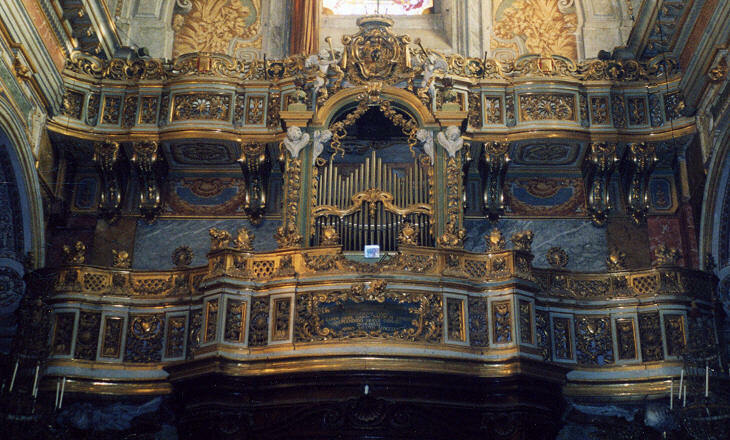 S. Spirito in Sassia has the best remaining example in Rome of a Renaissance organ. Its design, attributed to Antonio da Sangallo or Andrea Palladio, echoed a Roman triumphal arch and was influenced by the Architettura, a treatise published in that period by Sebastiano Serlio. Serliana is any architectural element composed by a central arch flanked by two rectangular openings. Serliana became a pattern for the design of organs and it was followed until the end of the XVIIIth century. The coat of arms above the organ belongs to Pope Paul III Farnese (1534-49). The organ of S. Spirito in Sassia is located at the middle of the nave, a rather unique positioning, because the preferred sites were above the entrance or in the transept. 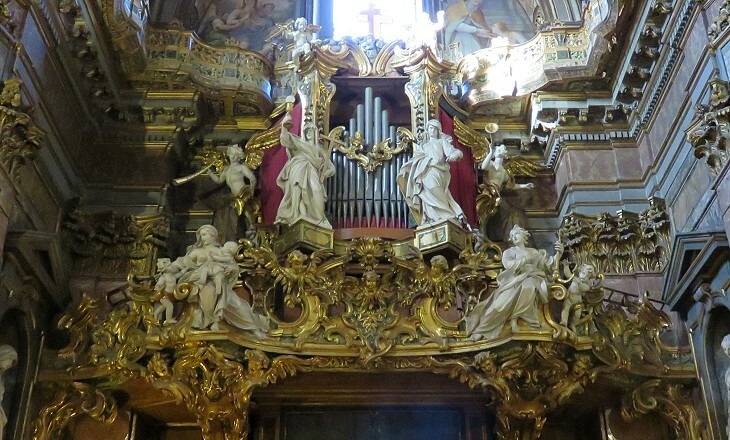 In the XVIIth century the development of more complex musical structures, with soloists and other instruments being added to the choir and the organ, required the use of two organs of a smaller dimension which were located on both sides of the transept (see here above one of the 1668 organs of S. Maria in Traspontina). During the process by which old St. Peter's was being replaced by the new basilica, S. Giovanni in Laterano became the site of the most important religious ceremonies. In 1597 Pope Clement VIII Aldobrandini decorated the wall of its right transept (which is also an entrance to the basilica) with a gigantic organ. The central pipe is 8 feet high and it weighs more than 400 pounds. 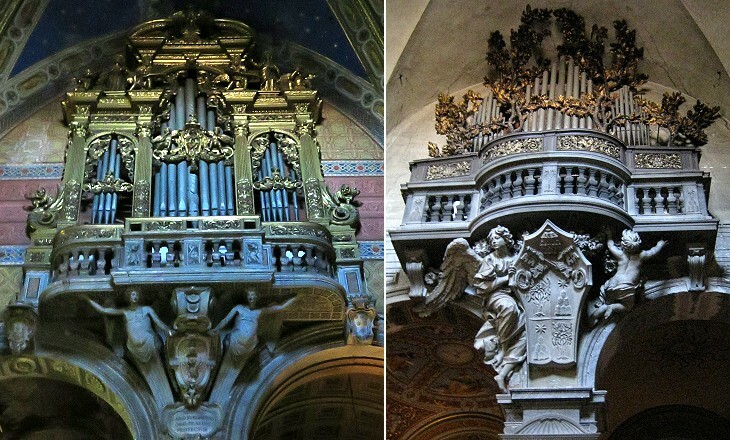 The organ (meaning the musical instrument) is a work by Luca Blasi, while its decoration is attributed to Giovan Battista Montano. The whole wall is devoted to themes related to music. There are reliefs showing musical instruments and statues portraying Ezekiel and David in the act of playing. 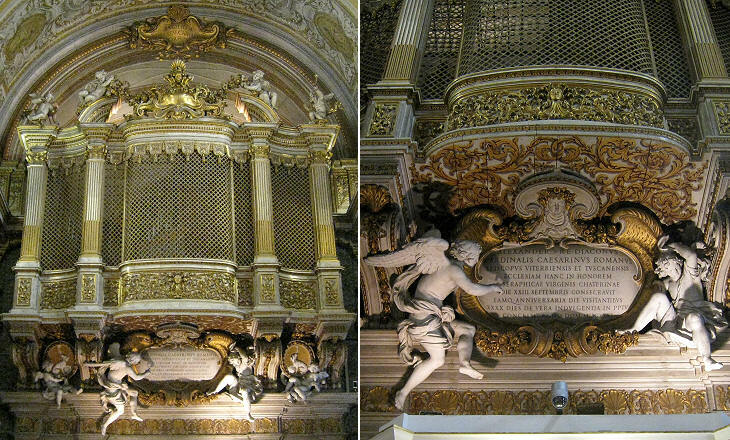 Cardinal Scipione Caffarelli Borghese, nephew of Pope Paul V, protected the arts and paid for the two organs of S. Maria sopra Minerva, which were designed by Paolo Maruccelli in 1628. Gian Lorenzo Bernini proposed to Pope Alexander VII a design more strictly linked to the coat of arms of the pope. The organs Bernini designed in S. Maria del Popolo in 1655 are based on branches of oaks forming a very unusual Serliana, oak being one of the heraldic symbols of the pope. 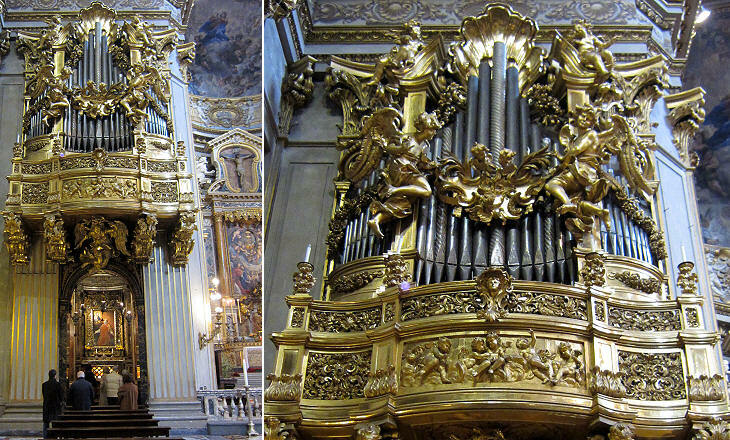 The two gilded organs of S. Maria in Vallicella were designed by Camillo Rusconi for the Holy Year 1700 and they are remarkable for their extremely rich decoration. While the positioning of two organs in the transept is common in large churches, in the smaller ones the organ and the balcony for the choir were usually located above the entrance. In S. Caterina a Magnanapoli the organ and the cantoria are combined in a sort of separate temple with a screen hiding them. 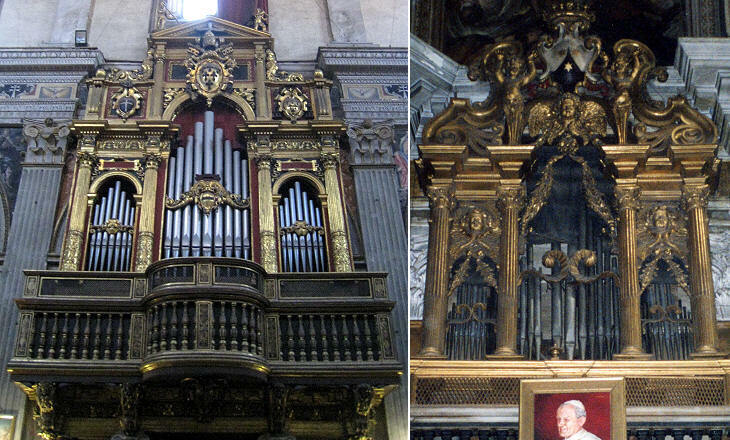 Although for many cantoria and organs we know little about their history and who designed them, they are a clear indication of the high level of skills available in Rome during the XVIIth century and for most of the XVIIIth century as the rich cantoria of S. Maria della Scala testifies. 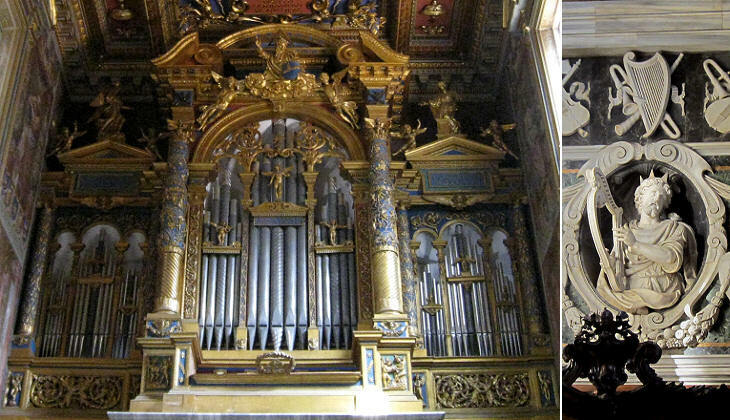 Another example of the excellence reached by the artisans working in Rome is the rich organ and cantoria built in 1748 in S. Antonio dei Portoghesi. Because the space was limited the cantoria was prolonged on both sides along the nave. S. Maria Maddalena has perhaps the most imposing and rich combination of organ and cantoria. The design is very complex and for sure it was developed by one of the several architects who worked at this church. We know that it took more than 50 years (1706-58) to complete it. The image used as background for this page is a relief showing musical instruments in the monument to Cardinal Favoriti in S. Maria Maggiore.